Athena is a selfish princess of the Kingdom of Victory, which inhabits a mysterious world. She was bored with the monotonous life day by day in her castle and desired exciting adventures. One day she opened the Door Which Shouldn't Be Opened in the basement of Castle Victory, and fell to another world called Fantasy World which was dominated by an evil emperor Dante, a creature based on Cerberus. The game features traditional RPG elements. 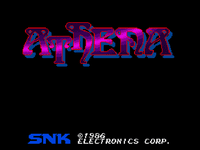 Princess Athena has to beat the boss of each stage by using miscellaneous mythological weapons, equipments and items. Without some items, she can not make it through the adventures. Everything in the game is inspired by Greek mythology or ancient Roman culture including weapons, equipments, items and enemy designs. Needless to say, Athena herself is named after the Greek goddess Athena. The NES port of Athena is considered one of the most difficult to finish in the NES library, due to its length, lack of mid-level checkpoints, and unforgiving play control. It has also received largely negative reviews from critics over the years due to poor programming, numerous glitches, and poorly designed features. Stan Stepanic of GameFreaks365 gave the NES port a dismal 4/10 in his review of the title, stating "Athena is by far one of the worst games for the NES. It's amazing how many qualities of this game are well below even the likes of a game like Action 52. This is just all-around terrible. There is nothing here that will interest anyone. It's a cool idea with some cool features that went horribly wrong in the programming of said features. I don't think I've ever seen this many mistakes and poorly programmed oddities in any licensed game, ever. Stay away." Source: Wikipedia, "Athena (video game)", available under the CC-BY-SA License.